July 9th, 2012 - Posted in Paris Events. 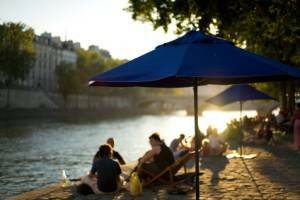 Every year, as temperatures start to soar in Paris, Parisians and tourists alike set out for the Paris Plages. 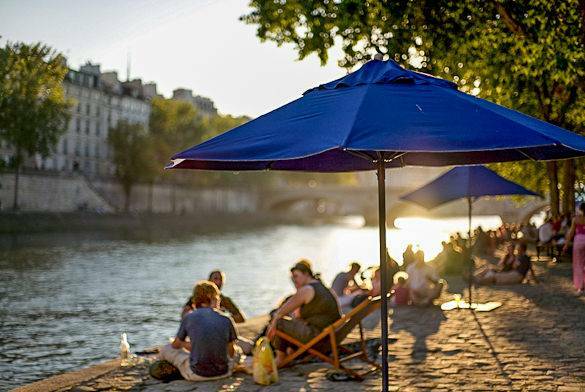 These urban beaches transform certain areas of Paris into sandy summer paradises for a whole month! 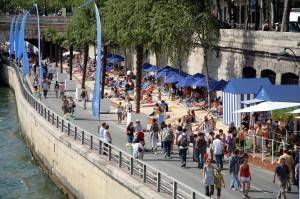 The first Paris Plage was organized on the banks of the Seine River in 2002 by the mayor of Paris, Bertrand Delanoë. He wanted to give Parisians who were unable to go on a holiday to the seaside the opportunity to experience the beach right in their own city. 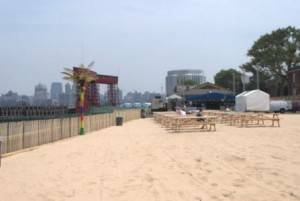 The event proved so successful that a new Paris Plage was opened at a location outside the city center, at the Bassin de la Vilette, in 2007, and the general idea of urban beaches has been copied by cities throughout Europe. This year, the 12th edition of Paris Plages is held. The beaches are opened on 19/20 July and can be visited until 18 August 2013. 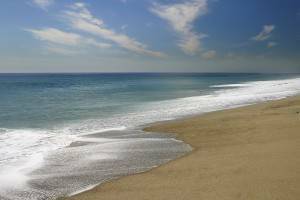 For 4 weeks during the height of the summer season, you can build sand castles, work on your tan at the deckchairs, and enjoy games of Pétanque. 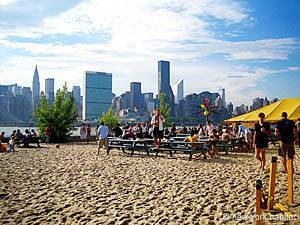 The beaches are open from 8 am to midnight each day, and they are completely free to visit! Because the two different locations both have some unique activities, we’ll highlight the Plage on the riverbank and the Plage at the Bassin de la Vilette below. The original Paris Plage is located on the right bank of the Seine River [see pin 1 on the map]. Starting July 20th 2012, the Georges Pompidou road is closed to traffic and turned into a pedestrianized zone from roughly the Louvre Museum to the Pont de Sully. Stretching almost 1 kilometer (3000 feet), the area right next to the river will feature real sand, deckchairs, and spots where you can play Pétanque. The beach will also feature water spouts where you can cool off, as well as a real swimming pool. All these things are completely free, so you can save your money for ice cream and drinks! The Paris Plage will also feature free performances to keep you entertained throughout the day. In front of the Hôtel de Ville there’s a square where a concert stage will be set up for Paris Plage [see pin 2 on the map]. Performances are held from July 19th to July 22nd at 5:30 pm until 11 pm, and they are completely free. For more information about the Paris Plages and the Hôtel de Ville line-up, see the official website for the Paris Plages (in French). 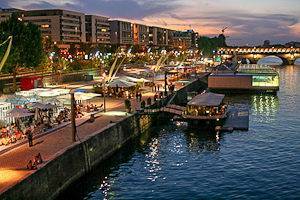 To get to the Paris Plage, you can take the 7 metro to Pont Neuf, Pont Marie or Sully-Morland. 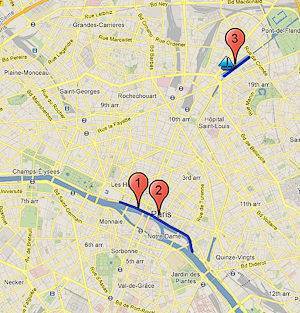 Alternatively, you can also take the 1 or 11 line to Hôtel de Ville and walk two blocks to the Seine. The Paris Plage at the Bassin de la Villette in the 19th Arrondissement will stretch from the Rotonde de Ledoux to the Rue de Crimée [see pin 3 on the map]. The Plage will also feature a sandy beach, as well as a real water sports complex! 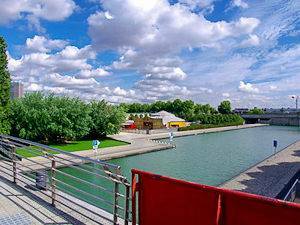 The Bassin de la Villette is the largest artificial lake in Paris, so it lends itself perfectly for boating. You will have the chance to try out row boats, kayaks, pedal boats and even small sailboats! There are restaurants, cafes and bars all around the Bassin, so you won’t even have to pack your own lunch. To get to this Plage, take the 2, 5 or 7 metro to Stalingrad station. If you still have some time left at the end of your day at the beach, you can check out the scenic Canal Saint Martin, which starts at the southern end of the Bassin. To find out more about the Canal and the bustling surrounding area, check out this article about the Canal Saint Martin. If you’re still looking for accommodation in Paris for the summer, see our vacation rentals in Paris to find your perfect Paris apartment! 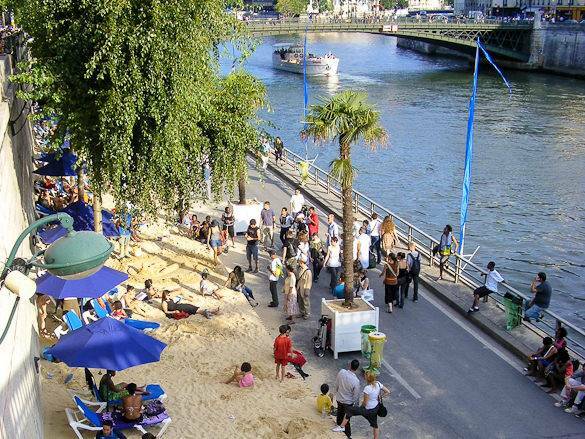 Have you ever visited an urban beach in Paris or another city?